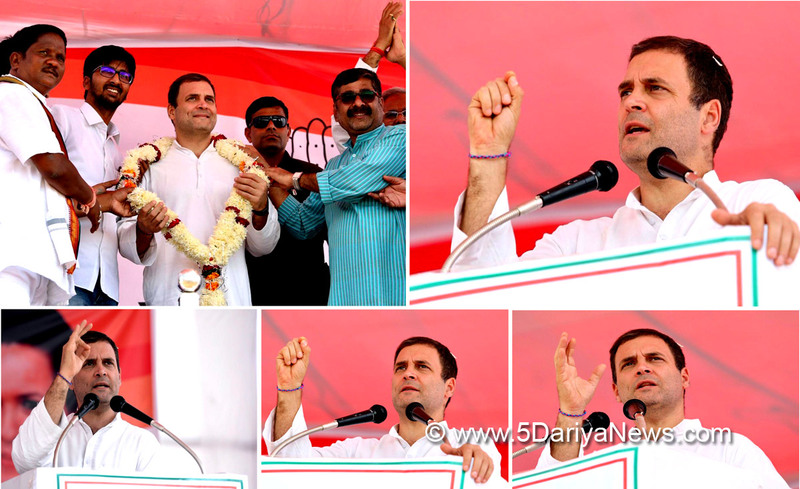 Congress President Rahul Gandhi on Saturday mocked Prime Minister Narendra Modi over his silence on the issues of corruption and alleged that he and Chhattisgarh Chief Minister Raman Singh are "corrupt". "Chhattisgarh is a prosperous state, but the BJP government steals from the people and helps 15-20 of its rich industrialist friends. Your natural resources are distributed among the rich. Chhattisgarh is the poorest state in India," he said addressing a public meeting here as campaigning ended in 18 seats in the first phase of the Assembly polls in the state to be held on Monday.Attacking Raman Singh, Gandhi said the "Chief Minister here is corrupt. ""Prime Minister says he fights corruption. But when it comes to Chhattisgarh, he doesn't say that the Chief Minister (Raman Singh) is corrupt. "Giving examples of corruption in the state, the Congress leader alleged that no action was taken in the Rs 5,000 crore chit fund scam case "as the Chief Minister did not want any action in that". "Over 60 people died and 310 FIRs were registered in the case but no action was taken because in the chit fund scam Chief Minister name was there. ""In the PDS (public distribution system) scam, Rs 36,000 crore was siphoned off. A diary was seized in that it was written that the money was given to CM Madam and Dr. saheb," he said, adding, "I want to ask Raman Singhji that who was the CM Madam and Dr Saheb." Gandhi said that if the Chief Minister does not want to answer these questions then he (CM) must explain to the people of the state that the Pakistan Prime Minister was sent to jail after his name appeared in the Panama papers. "His (Raman Singh) son's name appeared in Panama Papers but no action is taken against him because Raman Singh and Modi are corrupt," he thundered.Raking up the issues of unemployment in the state, Gandhi said despite 15 years of BJP rule in the state, over 40 lakh youth are unemployed. "Tribal land given to industrialists, teachers' posts vacant, no irrigation facilities in most lands despite 15 years of BJP rule. People of other states given employment here," he said. "We will stop it. People of Chhattisgarh will get jobs. Will give land to landless," the Congress chief said.The first phase of the Assembly elections in Chhattisgarh will see polling in 18 seats in eight Maoist-affected districts. The ruling BJP had lost 12 of the 18 seats in the 2013 Assembly polls. The remaining 72 constituencies will go to the polls in the second phase on November 20.